ROCKFORD, Ill. – The Chicago Blackhawks today announced they have assigned forwards Victor Ejdsell, John Hayden, David Kampf and Andreas Martinsen, and goaltenders J.F. Berube and Jeff Glass to the American Hockey League’s Rockford IceHogs. Each of the six players is eligible for Rockford’s potential Calder Cup Playoff roster. Ejdsell, 22, skated in 50 games with HV in the top level of the SHL this season, tallying 34 points with 20 goals, 14 assists and 32 penalty minutes. The Karlstad, Sweden native paced his team in goals and PIMs, ranked second among HV skaters in points and finished fourth in games played. Ejdsell then made his North American professional hockey debut with the IceHogs on March 23 vs. Milwaukee, and has since logged one assist in two AHL games with the IceHogs and one assist in six NHL games with Chicago. Hayden, 23, has spent the majority of the 2017-18 campaign with the Blackhawks, collecting 13 points (4g, 9a) and 54 PIMs in 47 NHL contests. The Chicago native was originally reassigned to the IceHogs on Jan. 8, made his AHL debut on Jan. 10 at Ontario and combined for 14 points (5g, 9a) and seven PIMs in 22 AHL contests. Hayden began his AHL tenure with eight points (3g, 5a) over his first eight appearances with Rockford, including a season-high five-game point streak from Jan. 17-26, and recorded three total multi-point efforts during his overall Hogs tenure. Kampf, 23, began the year with the IceHogs, making his North American pro debut on Oct. 7 at Cleveland before finishing his with 17 points (7g, 10) in 30 AHL games for Rockford. The Jirkov, Czech Republic native collected seven points (3g, 4a) over his final seven AHL contests prior to being recalled by the Blackhawks on Dec. 27, and made his NHL debut one day later on Dec. 28 at Vancouver. Kampf scored his first NHL goal on his birthday on Jan. 12 vs. Winnipeg and concluded his NHL stint with 11 points (4g, 7a) in 46 games with Chicago. 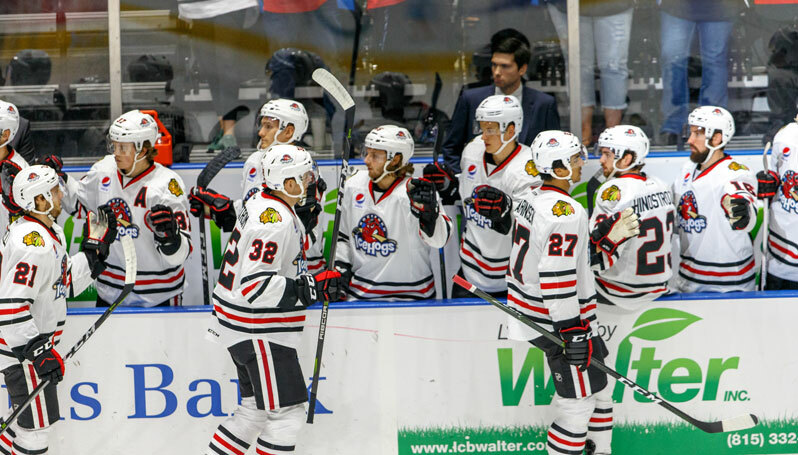 Martinsen, 27, has skated the majority of the 2017-18 season with the IceHogs, logging 26 points (12g, 14a) and 54 PIMs during his first season with the team. The Bærum, Norway native was recalled by Chicago on March 20 and departed the IceHogs ranked tied for third on the team in scoring, first among Hogs forwards in PIMs and tied for third among team Rockford forward with a +7 rating. Martinsen made his Blackhawks debut on March 20 vs. Colorado, scored his lone NHL goal of the season on April 4 at St. Louis and capped his NHL stint with 17 PIMs in nine total games with Chicago. Berube, 26, split the campaign between Chicago and Rockford, appearing in 13 and 15 games, respectively. He posted a 3-6-1 record, 3.78 GAA and .894 save percentage with Chicago, including earning his first Blackhawks win with a 42-save effort on Feb. 23 over the San Jose Sharks. The Repentigny, Quebec native now returns to the IceHogs having amassed a 7-8-0 record with a 2.37 GAA, .920 save percentage and two shutouts in 15 AHL appearances. Berube posted a 32-save shutout in his team debut on Oct. 7 at Cleveland and went unbeaten through his first five AHL starts with a 1.38 GAA and .950 save percentage in that span. Glass, 32, has skated with the IceHogs for the majority of 2017-18, compiling a 15-8-2 record with a 2.73 GAA and .907 save percentage in 27 AHL games. The Calgary, Alberta native has won five of his last six appearances with the IceHogs and ranks second on the team with his 15 total wins on the year. Glass, who was first recalled by the Blackhawks on Dec. 27, concluded his NHL stint with a combined record of 3-7-3, a 3.36 GAA and .898 save percentage in 15 NHL appearances with the Blackhawks. He earned his first career NHL win with 42 saves during his debut on Dec. 29 at Edmonton, and helped the Hawks to earn points in four of his first five appearances with Chicago.